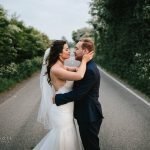 Being a wedding photographer at Nettlestead Place with a wedding like this is why I love my job so much 🙂 I knew the venue was something special after checking it out following my first meeting with Joy & Simon but this sentiment was multiplied 100 fold after I visited it before the wedding and had a good look around. 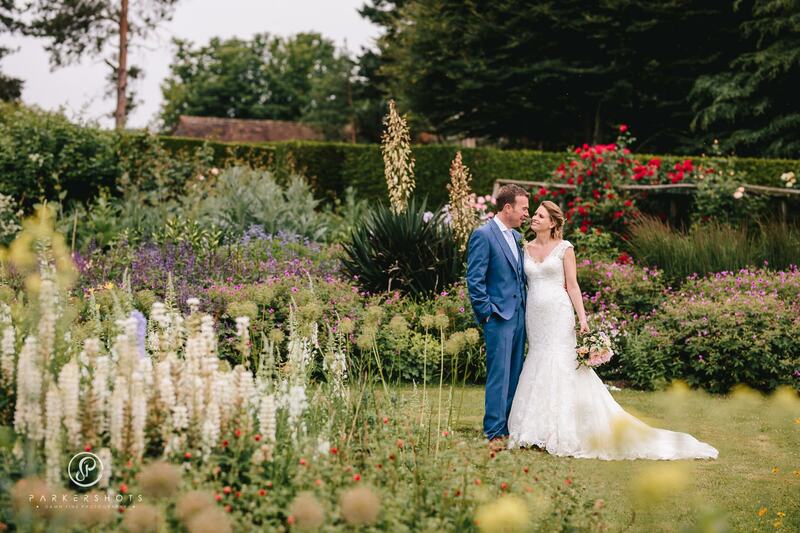 It has everything – an outside ceremony location with inside backup, incredible views, extensive gardens with beautiful features, a stunning historic house, and a pond. Even writing this now, doesn’t do it justice, so I’m very glad I can share photos to really highlight what it’s like here. 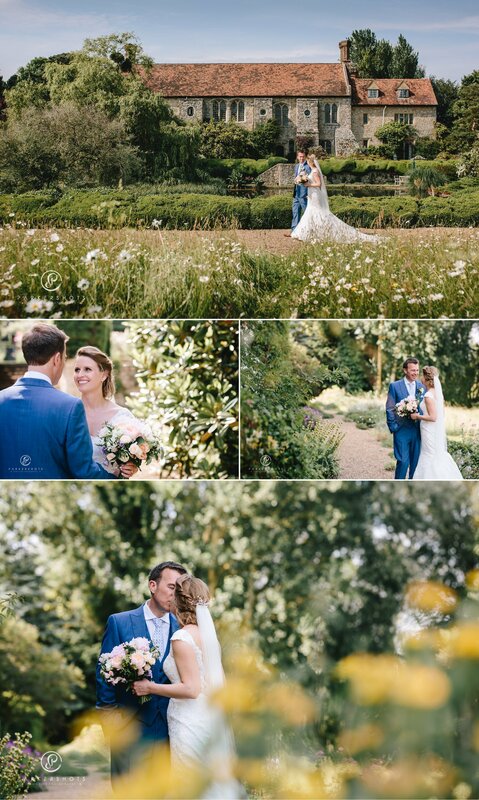 And, on top of all that, Joy and Simon had very stylish choices for their day and had chosen flower centric decorations which worked perfectly with the venue and really made it look even more special. This was particularly true with their choice of planks with trailing flowers suspended from the ceiling of the marque. These broke up the whiteness of the marquee beautifully and I’d thoroughly recommend them for any weddings involving a marquee. Speak to Suzanne at The Flowersmiths and I’m sure she’ll be happy to help. 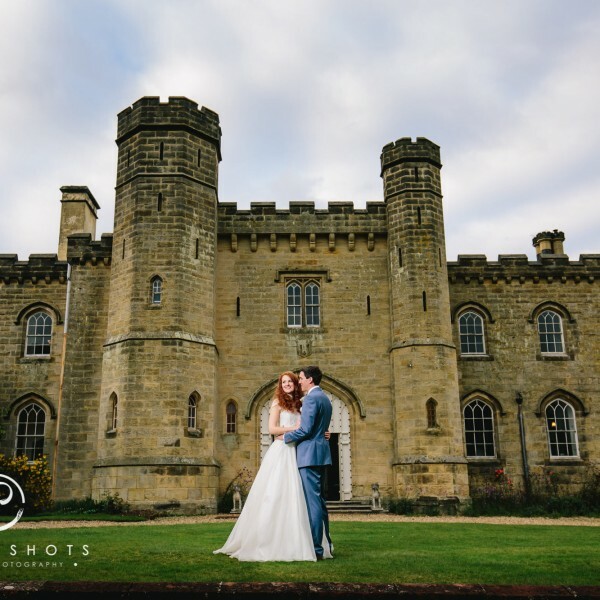 This was my first time as a wedding photographer at Nettlestead Place and I cannot wait to return here again soon. Even though it was my first time here, itt was nice to see some familiar faces; firstly there was Sharon from Majestic Events who is now the Wedding / Event Planner there. 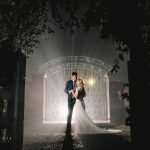 I’ve known Sharon for many years from when she was handling wedding for Bradbourne House and always enjoyed working with her. And in the morning prep, there was Harriet Rainbow and Liz from Simply Beautiful Wedding Hair. Both are a pleasure to work with and always done an amazing job. So, we have an amazing venue that’s been decorated superbly, a great team of suppliers, perfect styling choices, and on top of all that Joy and Simon were two of the nicest people I’ve met, who were patient and trusting with my choices of locations for photos, had great chemistry, and generally made my job even better than it already is. Thanks! 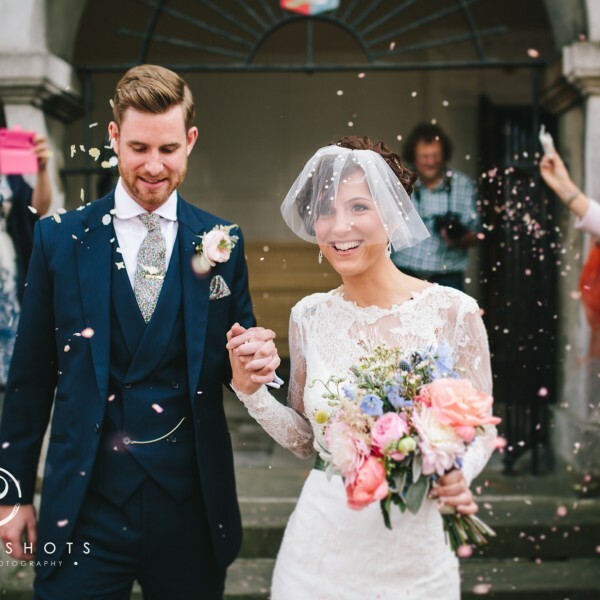 “We looked at about 6 venues across London and the South East. Nettlestead Place was actually our ‘wild card’. However, we really loved it for a number of reasons. 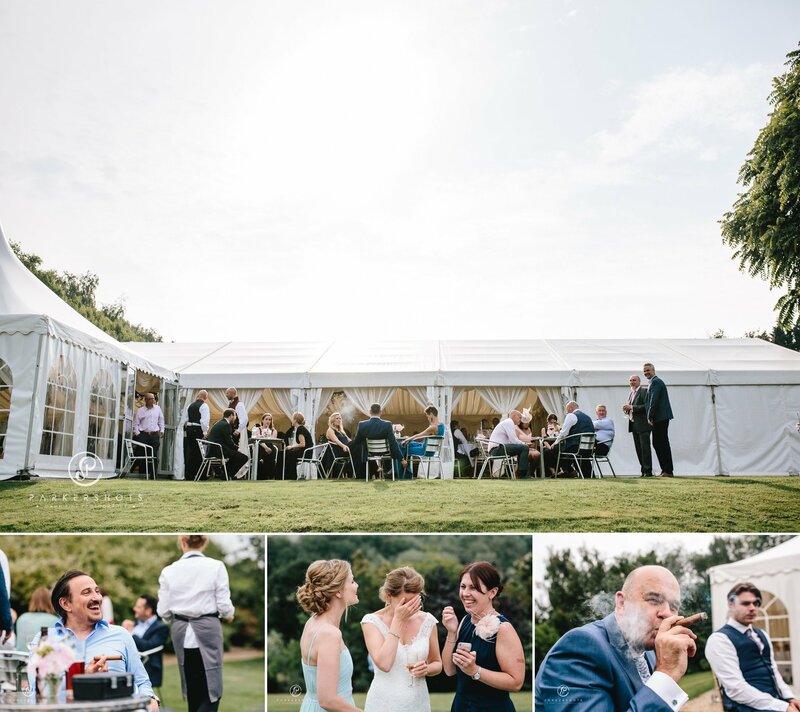 The venue and gardens are just stunning and we also loved the marquee and the fact it was such a blank canvas. 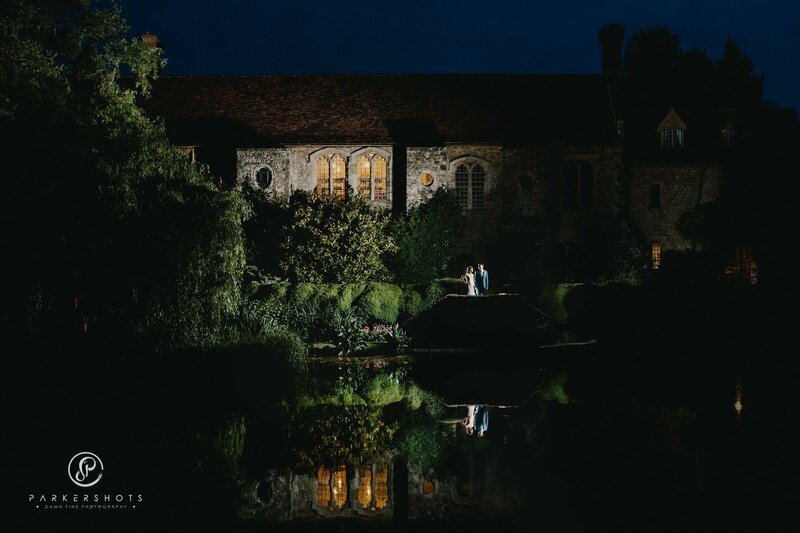 We also liked the idea of being able to have the ceremony outside (if the weather was kind) but also thought the Undercroft for the indoor ceremony was beautiful, meaning that we wouldn’t have been too disappointed if the weather was bad. “We didn’t have a particular theme, we just wanted the day to feel elegant and relaxed – and reflective of us personally. The gardens at Nettlestead are beautiful so we started with the flowers. We worked with Suzanne at The Flowersmiths and she was brilliant at bringing our ideas to life. We kept the ceremony flowers pretty simple as we were hopeful that we would be outside. 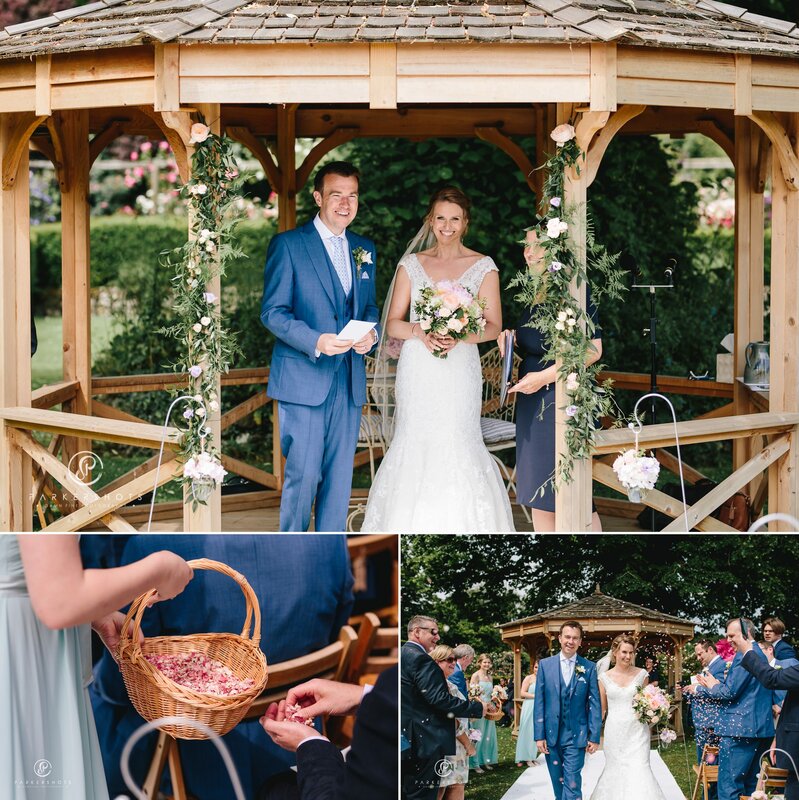 We used shepherd’s hooks with small vases down the aisle which we then moved to decorate the outside of the marquee after and a small spray of flowers tied to the outside of the gazebo. 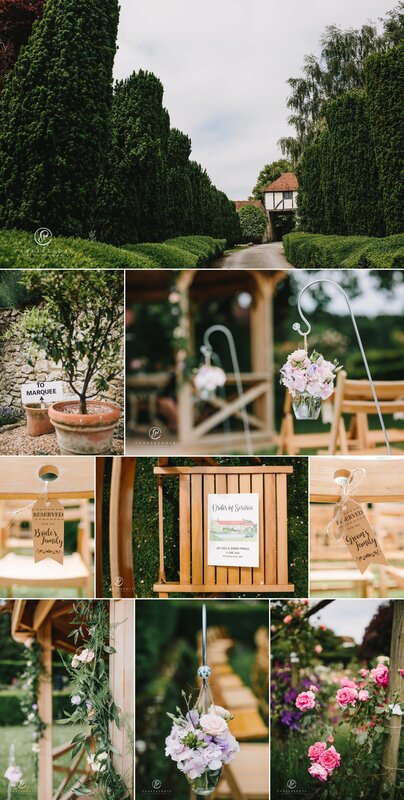 To reflect the outside natural elements, we used crates on the tables for flowers and had wooden planks with trailing flowers attached to the ceiling (our favourite decoration!). We felt that due to the whiteness of the marquee we needed some height in the decorations. We are lucky to have a very talented illustrator friend who then drew us a plank with trailing flowers which we used across all our main stationery (invites, name places, table plan) meaning this all came together really well on the day. Suzanne did an amazing job of re-creating Emily’s illustration on the day – we were blown away by it. Emily also drew an illustration of Nettlestead Place that we used for our Order of Service and to have as a printed keepsake for our wall at home. We both have a love of travel and rooftop bars so we named our tables after bars we had visited with fantastic views across the world. We used our photos for the ‘table numbers’ and added the phrase ‘Feeling on top of the world’ to the table plan. Another favourite decoration element was our cake topper. We used the brilliant Designs by Denisa who creates personalized caricatures from photos of you and the details of the dress, groom’s outfit etc. It did mean that Simon wasn’t able to see it until the day though as it would have given away the dress and headpiece! We asked her to create us sitting on top of a globe to fit with the theme of the tables. For colours we chose pink and peach pastels with pops of deeper colour – just to have a summery feel. 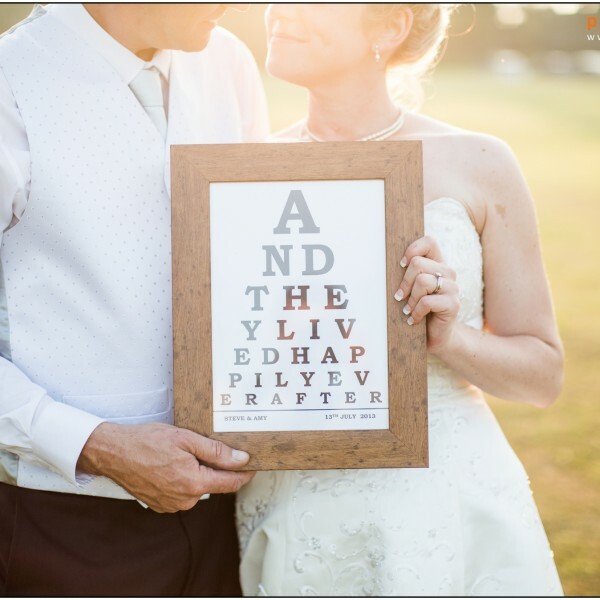 “We knew from the outset that the photographer was going to be one of the most important signings for the big day! 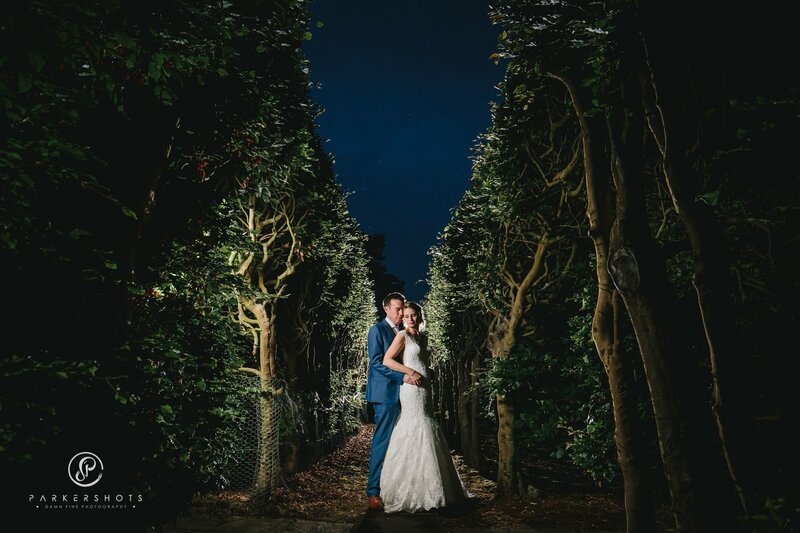 We met with 4 (blitzed it in one weekend) but we were blown away by Nick’s photographs – they really did stand out considerably. We also thought that the album choices were some of the most modern and elegant we saw. “Only a few things and they did not in any way detract from the fact we had the most amazing day. We should have trusted our own judgement more. We had one supplier that we were not happy with and we perhaps could have been braver and changed direction earlier on rather than thinking we should just stick with it. We were really conscious about not spending ages taking formal photos (we’ve all been to the weddings where they take forever) as we knew we would want to be talking to people. However, there are now a few that I wish I had captured when I look back over them so this is perhaps something to think more carefully about than we did. For example, we took one with both sets of parents and us but not one with us and each set of parents or one of just the bride and bridesmaids. Excel is your friend – we had one master spreadsheet and literally tracked everything we were doing – and spending. Enjoy it! The day goes quickly so it is good to soak up all the fun of planning it too. We had a band for the evening – Already Legends – who were just great. We had actually seen them at a friends’ wedding and loved them. We did our due diligence though and went to listen to them sober first – and still loved them so knew they would do an excellent job at keeping the dance floor busy. 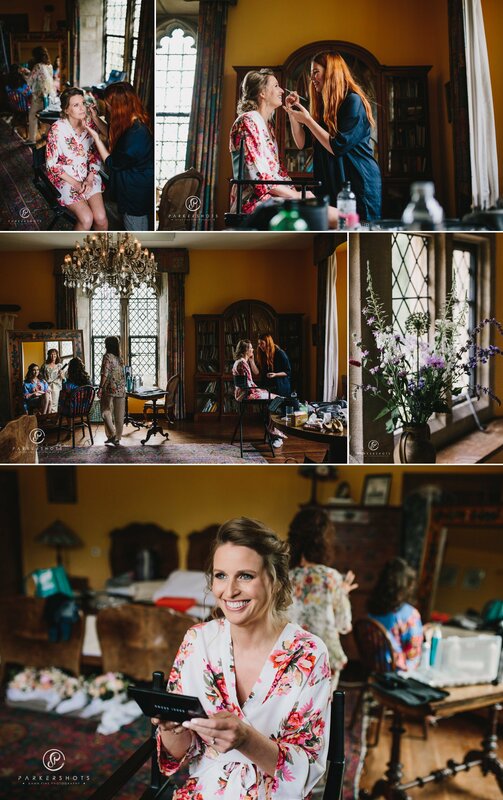 Both Harriet (Harriet Rainbow – make-up) and Liz (Simply Beautiful Wedding Hair) were fantastic to work with – we had a really relaxed, fun morning and I was so happy with both mine and the bridesmaids’ hair and make-up.